Currently, 59 games are supported. You don't need to search for "roms", as the games are already included in the emulator. Big thanks to Luca "MADrigal" Antignano for developing these awesome simulators and giving permission to make this possible; and also big thanks to Andre Leiradella (@leiradel) for his incredible work converting those simulators to Lua and creating the interpreter! Each game has different controls, because each machine has different buttons. If you keep pressed the START button, you will see a help window with the key mapping for the game that you are playing to. In a lot of games, the LEFT and RIGHT TRIGGERS are mapped to the "Game A" and "Game B" buttons. So, to start playing you should press the LEFT trigger (easy game) or the RIGHT trigger (difficult game). A few games have different controls though, and you can always see them pressing START. Besides, if you press SELECT you will toggle the ZOOM mode, making the screen larger. If you simmultaneously press BOTH TRIGGERS, you will exit from the current game to the menu. * There is a slight speed inaccuracy in a few games (mainly in the double-screen games). * The emulator has a memory leak in the Lua code, so when you play to 4-5 different machines, the emulator will stop and you will need to reset your console. * The PSP doesn't have enough buttons to simulate all the buttons of a few machines, so it is not possible to play a few games (Grab Man, Crazy Chewy, and Chicky Woggy Tini-Arcade version). These issues will hopefully be fixed in later updates. 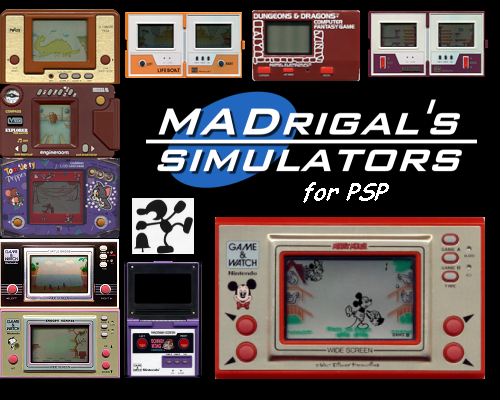 Big thanks to Luca "MADrigal" Antignano for developing these awesome simulators and giving permission to make this possible. Besides, big thanks to Andre Leiradella (twitter handle: @leiradel) for his incredible work converting those simulators to Lua and creating the libretro core to run them. Also big thanks to the Libretro team for caring about generic emulation for everybody!